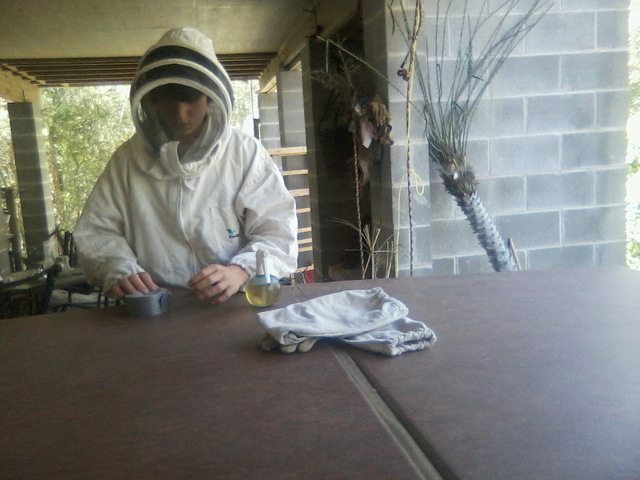 In case you don’t already know, Gabriel is our resident beekeeper. He’s 16 and is building quite a business for himself. It’s really exciting to watch. Every week we get calls from people who are looking for someone to come remove bees from their property. 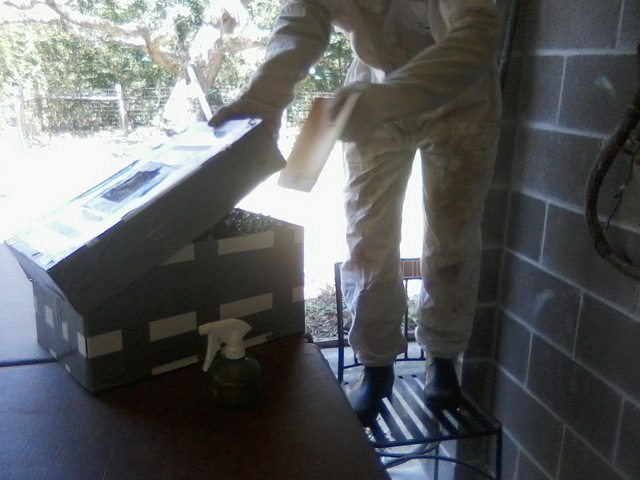 In addition to raising his own bees, Gabriel also does live bee removals. Sometimes they are very involved, like when the bees have made a cozy home inside a wall, and other times, it’s just removing a swarm. Although swarms look very intimidating, they are actually pretty docile. Their goals at this point is to protect the queen by huddling together and find a new place to live. As long as you don’t try to mess with them, you can usually go right up to a swarm and they’ll act like they don’t even see you. I apologize for the quality of the photos. In my excitment I forgot my camera and had to use my (dumb) phone camera. But I really wanted to share this wit you guys. This is Gabriel’s swarm catching equipment…. Fancy, huh? 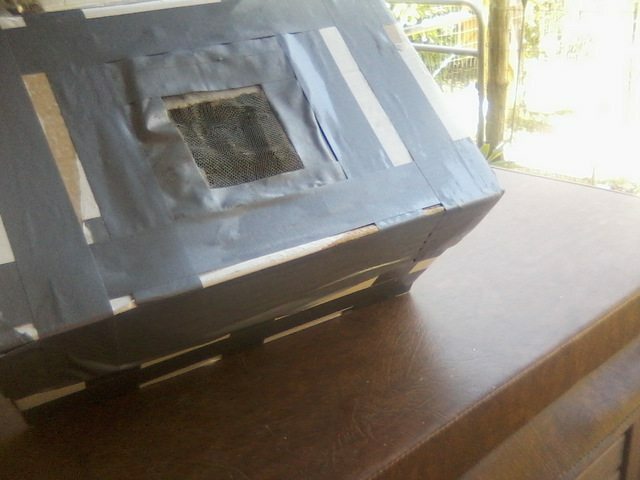 It’s just an empty paper box that has been reinforced with duct tape. Gabriel cut a hole out of the lid and put mesh screening over it, secured with duct tape. Gabriel in his full beekeeping suit – which his loving mama found for him (and one for Carl) for Christmas, I might add. I was not wearing a suit since I was only going to be taking photos. Oh, one other piece of fancy equipment. Some sugar water in a sprayer. 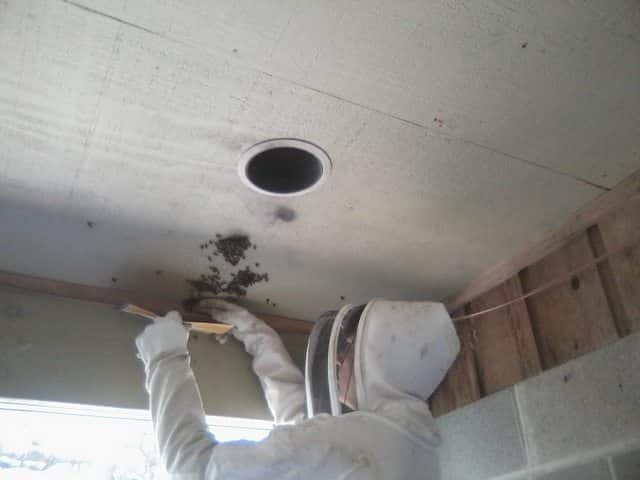 Take the lid of the box and scrape the swarm into it and quickly dump them into the box and put the lid on. You won’t get all the bees but you’ll get the vast majority of them and as long as you do that and get the queen, the remaining bees will not be able to rebuild. Then, Gabriel taped the lid to the box. These bees spent the night in Gabriel’s room (I know, you never know what you might find in a teenage boy’s room) and the next morning a friend came to pick them up. He has several hives already but wants to incorporate some local stock into his domesticatedbee’s genes. 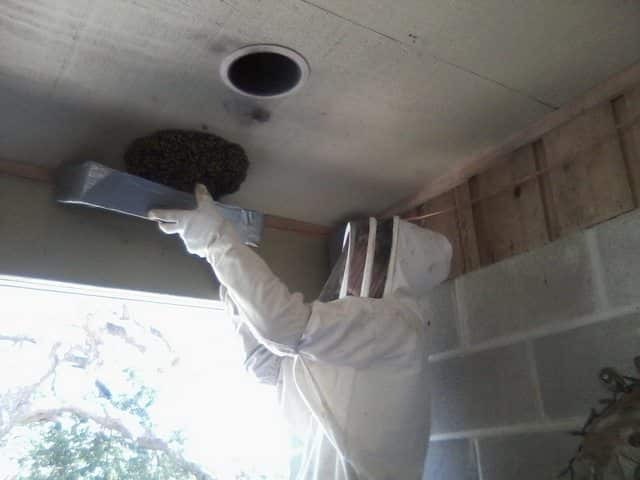 If you happen to need some bees removed from your property, please do not call an exterminator. 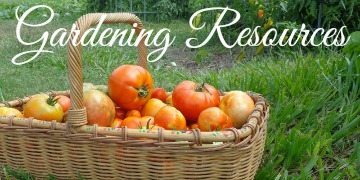 Call you local county extension agent office or you can find some listed at Bee Rescue Swarm Removal. P.S. 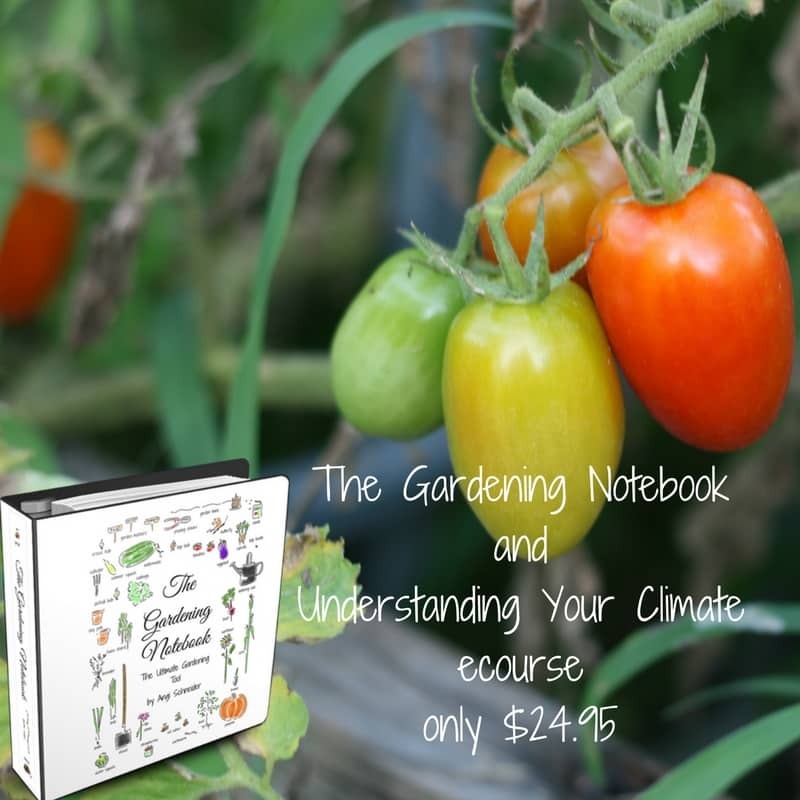 Don’t forget to enter the giveaway for the Moringa trees, it ends at midnight tonight. So interesting! 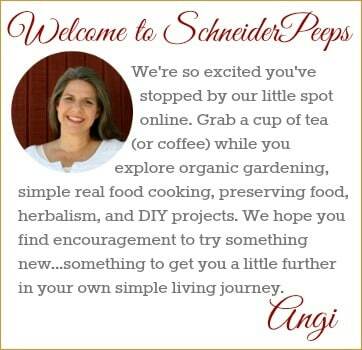 I am looking forward to my bees arriving in Early May. 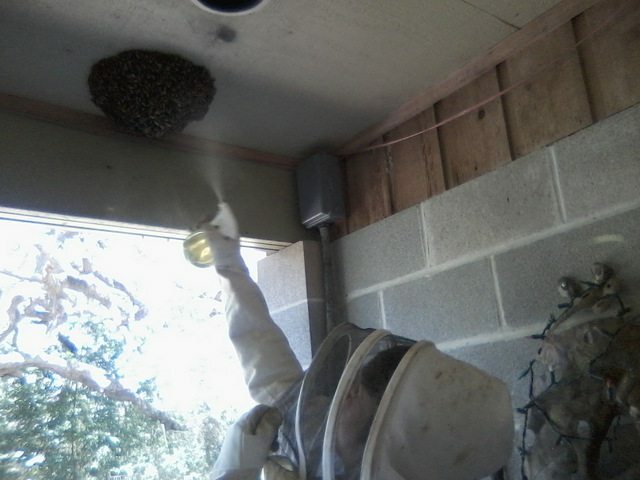 I have never caught a swarm that was quite that easy!!! Mine have always been in trees and much higher than I could reach. What a good idea to spray with sugar water. I forgot that little trick. I am sure you are very proud of this beekeeping skills. Yes, they were in a great place to be caught. My son has done many that were much harder and much more involved. This was a good one for me to on instead of my husband! We are proud of him, it’s funny seeing people’s faces when they realize they’ve been talking to a teen instead of an adult about their bee problem. He was the brave one – although he was also suited up. I just stood a few feet away and took pictures. Some bees are more docile than others. These were not agressive at all. I can’t wait until you get bees either. They are quite addicting.